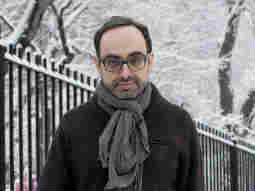 Gary Shteyngart's Nerd Passion For 'Zardoz' Writer Gary Shteyngart may have no idea what Zardoz is about, but that doesn't stop him from knowing the science-fiction novel by heart. For a nerd like him, nothing compares to the post-apocalyptic world full of floating heads and immortal beings. I grew up as a science-fiction nerd, probably the biggest one in the borough of Queens. Yearly subscription to Asimov's Science Fiction magazine? Check. Crayon-drawn diagrams of the Battlestar Galactica? You got it. Soylent Green, Planet of the Apes, Logan's Run. I knew them by heart. But I reserved my biggest nerd passion for a John Boorman and Bill Stair novel called Zardoz. I'm holding the gaudy saffron-colored paperback in my hand right now. God help me, I still read it to this day. What's Zardoz about? I have no idea. By any measure of logic, it makes absolutely no sense. But like every other piece of 1970s science fiction writing, it was set in a post-apocalyptic world, a future where my Hebrew school in Queens had thankfully been blown to smithereens. A world I could really fall in love with. The protagonist of Zardoz is named Zed. He's an angry dork living in a world of savage loin-cloth-wearing Brutals. One day, curious Zed stows away inside a floating head and gets transported to the Vortex, a Santa Monica-like paradise on Earth, whose inhabitants are called Eternals and who never die. It is they who have created his god Zardoz. The women of the Vortex look very much like Charlotte Rampling, and they treat Zed as their pet and science experiment, humiliating him turn by turn. A hundred pages later, Zed learns to fight back, in the end destroying the Eternals paradise and replacing it with a pockmarked ruined land not unlike New Jersey. The novel, steeped in the ethos of the early '70s, seems to think this is a happy turn of events. "He was a lone mammal, adrift in their land," the novel says of Zed, which is essentially how I felt the first time I left Queens for the seductive, complex land across the Queensboro Bridge. The Zed-like humiliations I suffered at the hands of Manhattan's young Charlotte Ramplings steeled me for what was required of me. Loss of innocence, the assumption of a strong conceited personality, an endless array of pretensions. I was being groomed for Oberlin College and for the Vortex beyond it. While I cannot quote you a single sentence of Jane Austen, I am embarrassed to confess that to this day, lines like "Stay close to me, inside my aura" and "Harvest produce report, submit surpluses and needs for inter-Vortex barter and exchange" fly right past my thick nerd lips. My Guilty Pleasure is produced and edited by Ellen Silva.